Barnesville, OH -- in the twilight of day's end a car moves slow, westerly up, down and around on Muskrat Road through Dickinson Cattle Co. In the last hours of light, slow moving cars watch for huge flocks of geese, deer, rabbits, sneaky varmints and of course colorful Texas Longhorn cattle on both sides of the road. Obviously this is not Disney Land, but the pleasant, colorful and pristine Ohio Appalachian landscape is a soft, satisfying simple-pleasure. It is free entertainment for those who enjoy nature, the land and multiple birds settling in for their last flights until tomorrow's dawn. Young and old do this evening visual. Each year the Muskrat road traffic increases, especially during the Summer and Fall leaf-changing months. An employee of Dickinson Cattle Co may drive up and politely "check out" a show-moving vehicle and ask, "Are you a cattle rustler?" Normally drivers quickly deny any idea of being a cattle thief and assure the ranch hand they could not get a big Texas Longhorn in the back seat of their car -- always believable. Muskrat road travelers may be young or old and often have big eyed children watching for all they are worth trying to be the first to spot some interesting critter. An occasional Amish neighbor will do a Sunday afternoon buggy trip or an end of day ride, often with a full load of family members. Muskrat road was a coal haul road during the early seventies. It cuts 4 miles through the middle of today's Dickinson Cattle Co. The company owns the road as well as parts of Fairview road and part of Ohio #800, yet years ago the government was given an easement for public travel. Manicuring of trees for the public helps the visual experience. Each year the cattle company trims trees along the Muskrat, brush-hogs Autumn Olives and removes dead Ash trees. This works to create a cleaner enjoyable appearance, yet it never ends. Erosion, weeds and down timber are a thing of the years in the ranching business. To do the Muskrat drive, exit off I-70 at exit 202, go south a country mile then turn west at the Muskrat road sign. Wind to the west. You will see the bright red ranch store building, and some cattle, but not as many as on the public bus tour. Muskrat road ends at Fairview road, turn right and it serpentines into the I-70 interchange at exit 198. Take it as slow as you like. 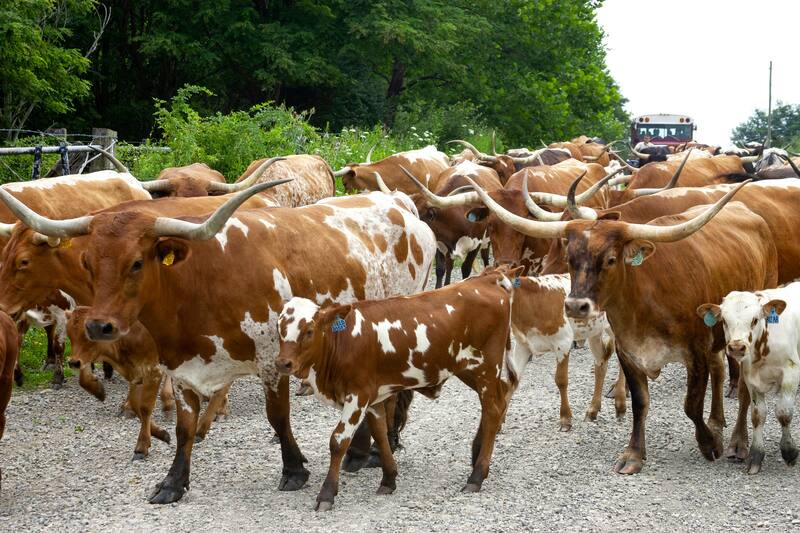 Some drives will confront DCC Texas Longhorn herds being driven right down the road to rotational pastures. In the late nineties things began to blossom in the Muskrat Valley. The Dickinson family started offering public tours of the cattle herds, pastures and lakes where the more attractive scenery could be reached by bus. Ranch employees chauffeur loads of guests. The guides present a 75 minute dialog about the history of Belmont County, strip mining of Muskrat Valley which brought in over two billion dollars, Texas Longhorns, and historic characters who where born, raised or lived near or actually on the ranch -- Hopalong Cassidy, Governor Wilson Shannon, Hanging Judge Isaac Parker, Johnny Appleseed and lesser know illegal operators, Mart and Milly Wilde, the Vinegar Valley bootleggers. 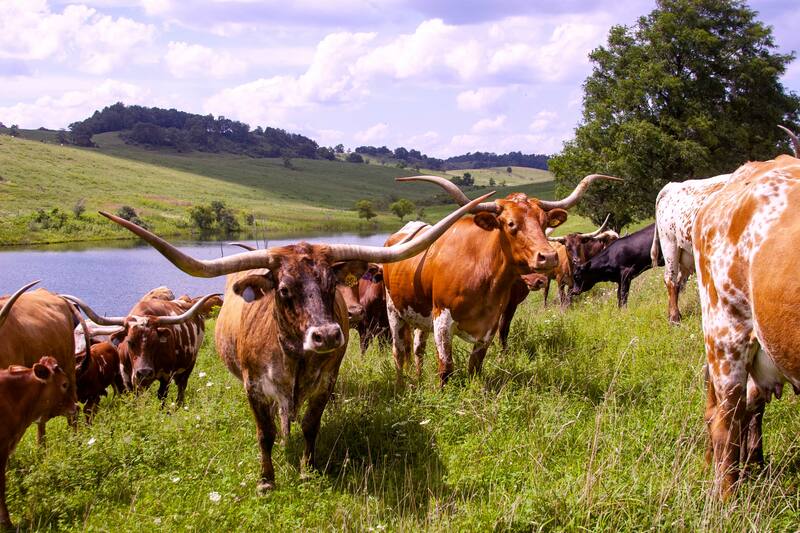 From Spring until Fall the Longhorns Head To Tail Tours are offered across the ranch. Tours go 6 days a week, except Sunday, for 10 or more people, by appointment. Always call ahead. The tours go all over the rolling hills then terminate at the Longhorn ranch store. Even if guests don't do a public bus tour, the store is open 6 days a week all year. It is free to view the store/museum and also free to drive Muskrat Valley road through the ranch. The ranch store is famous for lean USA grown Texas Longhorn beef. Don't be offended if you are viewed as a possible cattle rustler -- the herds are watched by several trained eyes. One dead-serious tip, do not get caught trying to load a steer into the family Jaguar. For more information www.head2tail.com or www.Longhorntours.com.